So you are going to San Diego Comic Con..
Congrats! You are doing what thousands wish they could do. And let me tell you, it is as exciting as you think it is. This year will be my 9th year going to SDCC. Over the years I have met some great people and have made many new friends. Now thanks to social networking, we can use it to our advantage to stay connected and even help each other around the con and navigate their way through San Diego. While many folks in San Diego have no problem getting around, I have met many out of towners who have had issues with transportation and lodging during Comic Con. This includes people who have camped out in the lines because they could not afford a hotel. I’ve also met folks who accidentally took the trolley down to the Mexican border because they got on the wrong one. Over the last few years, so many fellow SDCC attendees have helped me and provided me with information to make my con experience great. I’m here to return the favors. You may have already noticed that most if not all hotels near the convention center are sold out during the week of SDCC. You may have also noticed that the prices skyrocket the week of SDCC. Hotels that normally go for $170 a night are currently going for $300-$400 a night. Frankly, I don’t blame people for camping out in the lines with prices like that. Of course the further away you get from downtown and the convention center, the cheaper your stay will be. Then transportation becomes a factor. SDCC works in conjunction with hotels in the Mission Valley area. They also provide shuttle service to and from the Con throughout the day. These hotels also sell out relatively quickly and can cost a pretty penny. 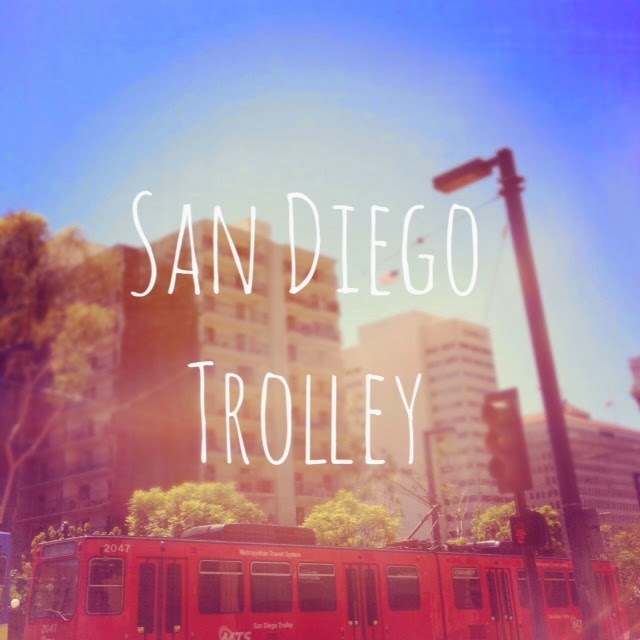 Mission Valley is a 20-minute drive to the convention center and a 30-minute trolley ride. Many SDCC attendees I ran into last year told me that they wouldn’t use the trolley for safety reasons or because it is too confusing. Which is very understandable. I grew up in the Chicago area and have had my fair share of negative experiences with public transportation. However while San Diego may not be perfect, there are rarely instances on the trolley where you would need to worry. Trolley security is also heightened during big events like SDCC. I absolutely love the trolley for the main fact that I don’t have to deal with the parking or traffic in downtown and for the fact that it drops me off at the front steps of the convention center. Every year I go to SDCC, I use the trolley. The Blue line, the Green line and the Orange line. All of which interconnect at some point downtown. 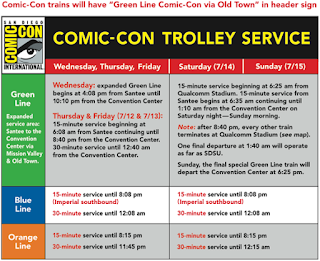 During events such as SDCC, a Red line is added that extends from Qualcomm Stadium to the Convention Center. All three lines come within walking distance of the convention center. Since I commute from the East County area, I use the Orange line and get off at the 12th and Imperial stop for SDCC. 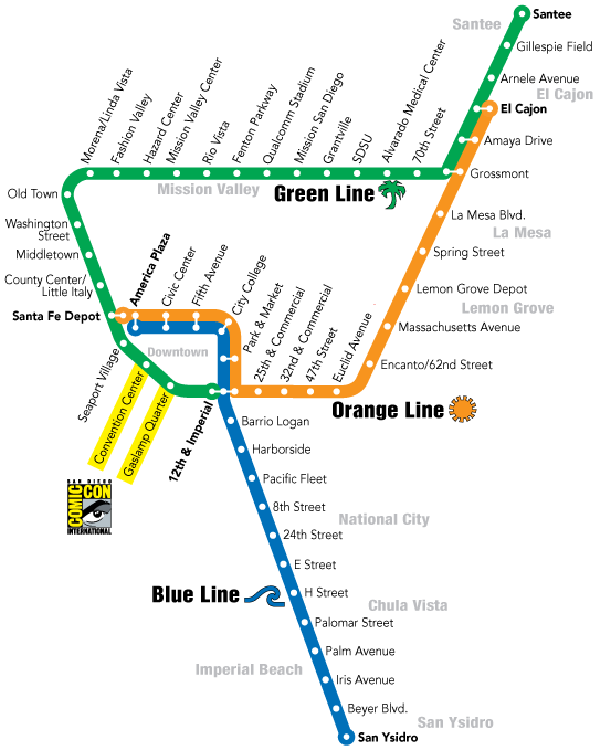 The Green line also serves the East County area and drops you off at the Convention Center. It is a stop you can’t miss. I personally prefer the Orange line because the stops are less frequent and it avoids larger transit depots. I also prefer getting off at 12th and Imperial because I can walk to the Convention Center and avoid waiting the extra 15 minutes for the trolley to loop around to the Convention Center. One of my favorite aspects of the trolley is the price. For $5 you can get a day pass that is valid for the entire day and for all three trolley lines. One-way fares are $2.50. Event passes are also offered during SDCC and can be purchased at all stations via the ticket vending machine. The event passes are $20 for the 5 day, $15 for the 4 day, $12 for the 3 day, $9 for the 2 day and $5 for the single day. Last year, Special Edition Commemorative Passes were sold at specific stops with agents present. According to MTS, these will be sold again this year. Which stations they will be available at is yet to be determined. All ticket vending machines take cash and credit/debit. At the front of the trolley along the header, the specific trolley line is listed. The most important thing is to remember when the last trolley leaves for the day. The green line for example may have the last train leaving at 11pm, but it may not actually go as far as your destination. With that said, always make sure to find out if the last trolley goes to your station. I’ve been stranded a few times at San Diego State University because that’s the farthest the last trolley went at the end of the night. 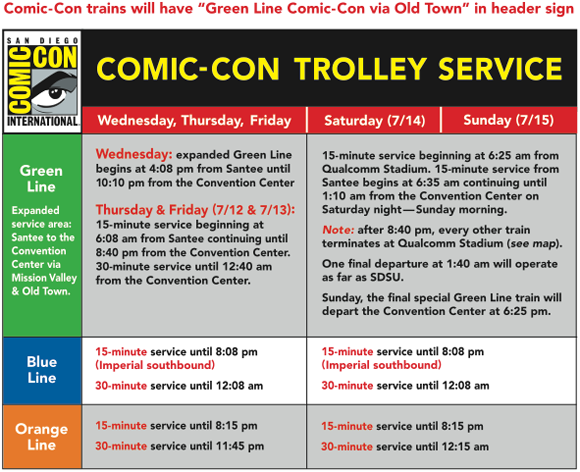 Although the schedule will change for the weeks of SDCC, here are the current timetables for all three lines. Always keep your ticket on you. I keep mine where my Comic Con badge is. If you ride the trolley without a ticket, you can be fined. Hold onto your belongings. Sometimes the trolley is so full that it is standing room only. Don’t risk having item stolen and don’t use seats as storage benches. It you are wearing a costume (especially if it involves weapons) keep your SDCC badge on you. This avoids any issues where you might frighten people. Don’t eat on the trolley. The rides are not always smooth and rides become very unpleasant when you are stepping all over a hamburger and fries. Always know what time the last trolley leaves for the night and if it goes to your station. And finally, ask for help if you need it. We don’t mind helping people. 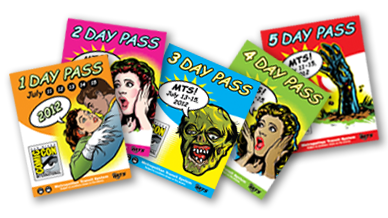 MTS does not release their updated schedule and ticket info until the week prior to SDCC. Any SDCC attendees with questions, concerns and comments can feel free to contact me via twitter at @SarJo87. I will respond to all. Good luck and have fun!